Dixon… State Representative Tom Demmer (R-Dixon) was appointed to the post of House Republican Caucus Chair today, earning him a leadership role in shaping policy for the growing caucus. Demmer is the Director of Strategic Planning at KSB Hospital in Dixon. Prior to his election to the General Assembly, he served on the Lee County Board. Demmer graduated from the University of Dayton, after having served as a White House intern in the Office of the Vice President of the United States in 2006. Demmer is a 2016 Henry W. Toll Fellow with the Council of State Governments. He serves on the Board of Directors of the Ronald Reagan Boyhood Home Preservation Foundation. He is a co-founder of the Future Caucus of millennial legislators in Illinois, and a member of the Joint Committee on Administrative Rules. “I am honored to join the House Republican leadership team,” Demmer said. 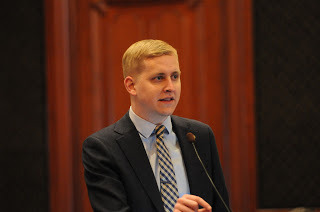 “I’m proud of the work our caucus has done to fight for a better future for Illinois, and I look forward to working with Leader Durkin and all my colleagues in the 100th General Assembly.” 90th District residents can connect with Rep. Demmer and learn more about legislation sponsored by Rep. Demmer during the Spring legislative session at his website at www.tomdemmer.org.